Aubrey brings a distinct and fresh approach to New York City real estate. With a background in Fine Arts, she is passionate about design and architecture. In 2012, she began her real estate career in new development in Williamsburg, Brooklyn. Since then, she has worked on rental and condominium projects across the borough. 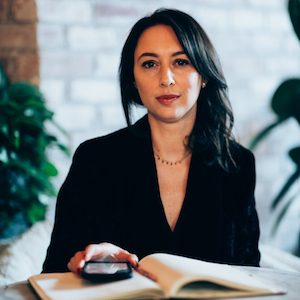 In 2015, her focus shifted to diligently studying real estate trends, which has allowed her to navigate the ever-changing Brooklyn market better than most. In addition, she has worked closely with many owners consulting on finishes and floor-plans to give their properties a competitive edge. Aubrey is known for her thorough knowledge of inventory, creative negotiating, and signature prewar loft aesthetic. Her enthusiasm for unique property and her extensive market create a stellar experience for her clients that is truly one of a kind. "Aubrey was very responsive and professional. As a first time NYC renter, she helped us navigate the process and gave us valuable guidance. I would strongly recommend her." "I was working on very tight timelines for a sudden relocation for work and Aubrey absolutely killed it! I had about two weeks to find an apartment and I was only in town for one or two days each week. To maximize my time, she was able to narrow down the prospective properties and didn't waste time showing me places outside of my criteria. I fully expected the search to last 2-3 weeks, but we were able to lock down a place in Fort Greene on the first visit. Even though I was satisfied with the monthly rent amount, Aubrey went the extra mile to get me concessions on a storage unit. Her knowledge of the market, the neighborhoods, and her professional network made the whole process extremely smooth. I would work with Aubrey again in a heartbeat."